‘Many Different Perspectives’ Students in the Cape Town Summer Internship Program gain professional experience and a better understanding of South Africa’s culture. W&L student group at the Cape of Good Hope. Photo courtesy Connect123. 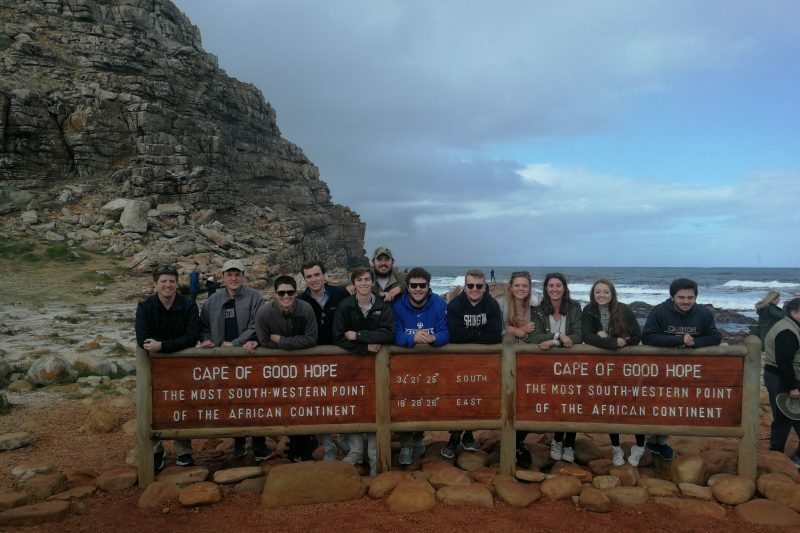 Thirteen W&L students traveled to Cape Town this summer to get experience in professional fields and learn more about South Africa’s culture, climate and history. The Cape Town Summer Internship Program is an eight-week program offered by the Business Administration and Politics departments that combines in-class learning with field work. Students from different major disciplines engage their readings and navigate their field work through class meetings, a paper, journaling, blogging and a final poster. Participating students work 30 hours a week in various fields that match their professional interests, such as advertising, education, finance, human rights and web development. They get practical experience, but also enjoy the opportunity to give back to the community. From visiting the Cape of Good Hope to doing service on Mandela Day, the students immersed themselves in the local community. Their internships, along with other site-based and classroom learning opportunities, foster a deeper understanding of South Africa’s post‐apartheid political system and societal landscape. While interning at Workers World Media Production, Tate Mikkelsen ’20 attended the protest on Refugee Day in the city of Cape Town and interviewed the people present there. Through this internship, students have gained invaluable insight into their future careers— as well as their role in the global work force. Find out more about students’ #wlusummer18 experiences on Facebook, Twitter and Instagram — @wlunews. All photos in the following slideshow are courtesy of Connect-123.